With repetition over time our habit loops become automatic which is another way of saying that our brains stop taking an active (conscious) role in our decision-making. In its place, cue and reward become connected to the point that “a powerful sense of craving and anticipation emerges.” Thus, that feeling that overcomes me: I must have that peanut butter! Reading Duhigg’s book it struck me that as music listeners we often approach our favorite musics as kinds of habits with their own cues, routines, and rewards. Music can give us a kind of “fix” of our favorite sound combinations. What’s more, it’s also excellent at creating desire within its own structures–setting up stimulus cues through melody, harmony, and rhythm and then prolonging our wait for the reward—like that huge chorus, the cathartic chord cadence, the infectious hook, or the massive beat. But the way music constructs desire through change and repetition is the subject for other blog posts. Reading Duhigg got me thinking specifically about our listening habits themselves: how some kind of desire to hear music functions as the cue, how listening to a music is the routine, and how pleasure (or something else along the same sensory continuum such as catharsis maybe) is the reward. Have you ever thought about your music listening practices as habit loops? And have you ever wondered how mutable your listening habits actually are? I have particular musics that I return to from time to time for reliable and repeatable listening experiences. For instance, when I want a “logical” experience I often reach for J.S. Bach. Or when I want an interaction” experience where I can hear musical dialogue I reach for jazz or maybe duets such as the musical conversations between kora player Ballake Sissoko and cellist Vincent Segal on their excellent album Chamber Music (which I have written about here). When I want a “static” experience I might reach for some drone-oriented sound such as Hildur Guðnadóttir (whom I have written about here). Or when I want a “filmic” experience I reach for something like the electronic duo Deaf Center. Or when I want a “nostalgic” experience I turn to music I first heard when I was a teenager (progressive rock, 80s synth pop). These are just some of the ways I habitually organize my listening. I check out new stuff too, of course. And I always listen to new mainstream pop just for its novel sounds. I’m sure I’m not alone in organizing my listening depending on what kind of experience I wish to cultivate. But it’s not a science. There are many, many ends to which we can put our listening means, and the same music can serve multiple agendas. J.S. Bach may be “logical” music for me but merely pleasant polyphonic ambient background sound for someone else not into Baroque rigidity. Music always depends on its listeners for its meaning. But how do we get out of our music habit loops? How do we cultivate novelty in our listening habits? The challenge with experiencing new musics, of course, is that as listeners we get used to a familiar set of cues to indicate to us whether or not we’re “interested” or we “like” the music enough to keep listening. 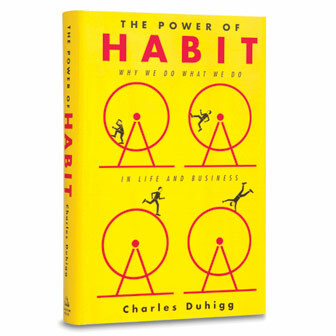 But Duhigg tells us that we can change our habits if we change the routine while keeping the cues and rewards the same. So: how might we keep our already accepted cues for listening to our go-to musics and their perceptual rewards while opening ourselves to new musics? Can we apply Duhigg’s model to cultivate new listening habits? One day a few weeks ago, my friend Gary, a bass player and producer, suggested that I listen to the contemporary country band Lady Antebellum. “The production is incredible, man” he told me, as if you could separate production from the music, “and all the layered guitars are very deep.” Wait a second. This was just the kind of opportunity for a listening experiment I was looking for. Could I modify my listening habits and actually get into country music like Lady Antebellum? I decided to try. After all, what’s the worst that could happen? I’d become a diehard fan and renounce all other music? As if. The plan was simple: set up a “Lady Antebellum” station on my Pandora Internet Radio app and just start listening for one whole week. The rules of the listening experiment were equally simple, yet severe: whenever I felt like listening to music (and usually this would be while I was riding the subway), I could only tune into my Lady Antebellum Pandora station and let country music do its Good Work. The goal was to stiff-arm my listening routine so that I only listened to country. So off I went, headphones on, to hear what would happen. The idea is that if you like this particular song that has these musical attributes, you’ll probably also like this other song by a different artist whose music shares similar attributes and thus probably has a similar sound. Clicking the Thumbs Up or Thumbs Down icons then, allows you to nudge Pandora towards more songs like the ones you’re liking. (You can read more about Pandora here.) I chose not to press the Thumbs Up or Thumbs Down icons and just leave Pandora to her own devices. One morning several days into my country music listening my wife Natasha asked me, “So how’s your experiment going?” “Okay” I said, sounding a little dejected. “It’s harder than I thought and I’m struggling.” I was a committed listener, but it was hard to shake the feeling that the songs were too wordy (I like instrumental music) and the chord progressions too predictable (I like harmonic adventure). Not only that, my sense of musical taste felt immune to country music’s pleadings. I was staying the course though and Natasha found my self-imposed struggle humorous. “Why does it have to be an experiment anyway?” she asked, laughing. I guess it had to be an experiment so I’d have an excuse to learn something about country music as a genre with its own conventions of expression. And I was learning something. I have to say, the music on the Lady Antebellum Pandora station was sometimes moving and always heartfelt–or at least it constructed and performed heartfeltness very, very effectively. It did this lyrically and musically. Lyrically, the songs’ subject matter was mostly about love, longing, memories, loss, religious faith, cars and pick up trucks, the experience of small time America, promises, and comparing a “good woman” to lots of valued things like say, a well-worn pair of tennis shoes (no kidding: see for example Brad Paisley’s “She’s Everything”). Most importantly, the songs told simple stories embedded with life lessons. It’s easy to follow a country song’s lyrics, but before my experiment I had never bothered trying. Musically, country songs hammer home their heartfelt stories through a kind of sonic sentimentality. All of the songs I listened to featured twangy expressive vocals, slow tempos, a good solid backbeat on two and four, simple and reassuring chord progressions, acoustic piano, layers of guitars (especially slide guitar–that singular signifier of country wistfulness), and pleasantly predictable arrangements that always have a breakdown (rhythm section sits out for a few measures) before the final chorus returns to take us to the end, full throttle. The music has the effect of framing whatever you’re doing (I’m riding the subway, listening as I type on my phone) to create the sense that you’ve stepped into a middle-of-the-road Hollywood movie–specifically the montage section where someone is say, looking over old letters and reminiscing about good times past. The kind of movie you might watch while on an airplane because you have nothing else to do. I know it sounds like I’m making a judgment here, but the music really sounds like a film soundtrack. As I kept listening to my country station, Pandora was making assumptions about me too, bombarding me every thirty seconds with pop up ads for Busch beer, a dating site called Christian Singles, and DeVrie University, among other things and services. Clearly there is a country music demographic that advertisers have access to through pinpointing and then catering to their musical taste profiles. The lesson here is that our musical tastes can help advertisers identify our broader socio-cultural identity profile. So after a week of pretty constant listening and not changing the station I took stock of my progress. It turns out, you’re probably not surprised to hear, that my experiment didn’t re-wire my listening habits. Why is this? Why haven’t I been able to change my listening habits and love country music as something cool? One possible answer is that I haven’t spent enough time with it yet. Maybe I need a few years. But therein lies the catch: we tend to only spend time with musics we actually like, deepening out appreciation for them even more. When we don’t immediately like a music, we tend to stand clear of it. All this to say that it’s difficult to re-wire ourselves to love a music because it’s difficult to stick with something that you don’t really love. It’s clearly a catch situation. To sum up: I’m glad I ran the experiment, but even after some deep country immersion, I still find myself only finding a narrow bandwidth of all the music I’ve heard “cool” and this fact alone may say a lot about my own limitations as a listener. Yes, there are some lady Antebellum songs I like (I kept whistling “Need You Now” at home and passed the sonic virus to my wife who started singing it too within seconds of hearing the melody!). But overall I don’t love contemporary country music and probably won’t seek it out for a while. Having admitted this, I’m not scared of country music anymore (! ), and in fact quite open to its expressivity and its direct, plain-spoken qualities, appreciating it as a way of constructing a way of being in the world as valid as any other. And anyway, who is to say what’s good music is?